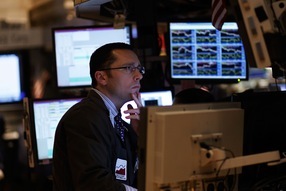 The Dow Jones fell below 10,000 in trading Tuesday afternoon, as jittery markets reacted to continued economic struggles in the Eurozone and escalating tensions between North and South Korea. Europe’s debt crisis continues to worry investors, sending the euro toward a four-year low (set just last week) against the dollar Tuesday. Market watchers have turned their eyes from Greece’s troubles to economic weaknesses in Spain, Italy, Ireland, and even Britain. On Monday, just a day after Spain’s central bank took over a failed major lender hit by real estate losses, the IMF warned Spain that it must urgently reform its banking and labor sectors if it hopes to recover from the economic crisis. Italy will unveil austerity measures this week designed to cut its budget deficit by 13 billion euros by next year, including hiring freezes and pay cuts for the public sector and a several months-long block on retirement for those approaching retirement age. Other news intensified the dour mood, including Britain’s struggle to unwind its massive debt, Germany’s preparations for its own budget austerity program next year (and considerations of a wider ban on short-selling), and a disappointing Case-Shiller Index — a closely watched gauge of U.S. real estate prices. Exacerbating the jitters: the situation on the Korean Peninsula. Markets in South Korea slumped after reports emerged that North Korean leader Kim Jong-Il ordered the military to combat alert Tuesday. “Investors were nervous already and there’s been very little news in the past few days to give them any more reasons to be confident in the near-term.” Jim Baird, partner and chief investment strategist at Plante Moran Financial Advisors told the Wall Street Journal.